Just browsing the net and I found this photo from my friend's blog. 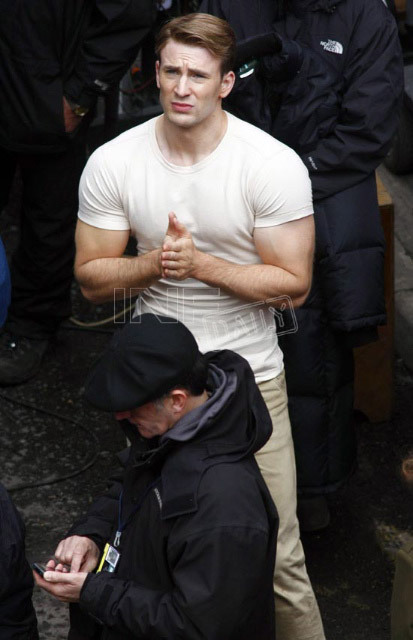 The first photo of Chris Evans as Steve Rogers on the set of The First Avenger: Captain America. As much as I like how Chris Bulked up for the role perfectly, I still have a little concern about something very intricate on the character. Why it seems that Chris have a brown hair here? If I recall, Steve Rogers sports a blonde hair and definitely never becomes a brunette on any story arc. I know this is just a minor detail, but the hair color is a very important element on Steve Rogers' character. Still hoping they can fix this. Baka ida-dye pa lang ang buhok niya? Sa post prod gagawin nilang blonde yan. Mas mura pa. Hehe. @tarugoman lolz, so mag-effort pa sila na i-CGI ang buhok.